Miss Amanda has always had fun playing with kids and making sure they are safe. This is why she loves being an OT! She loves all the swings at COTI and always has fun playing new games. When she is not at COTI, she likes to spend time with her family and friends, make crafts, and cheer on the Musketeers at Xavier basketball games. Miss Becca has always loved playing with kids. 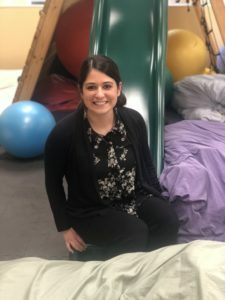 She loves being an OT because that means she gets to play with kids all day long! Miss Becca’s favorite swing at COTI is the rainbow swing and if she could, she would take it home with her! She also likes playing board games and making up new obstacle courses in the gym. When she’s not at COTI, Becca likes to play softball, volleyball and watch sports! GO REDS! Miss Breanna loves being an OT and working with kids because that means she gets to play and laugh all day! Miss Breanna used to do gymnastics and loves to swing and do tuck-and-rolls on the mats. She especially enjoys being silly and talking about big feelings even thought sometimes that is a very hard thing to do. When she isn’t at work, she likes to do yoga and hike around Cincinnati. Miss Cathy loves to play and have fun with kids! She loves her job because she gets to play with kids all day long. Miss Cathy enjoys listening to children’s ideas and playing fun games with them. When Miss Cathy is not at work, she enjoys playing at home with her 5 children. They love to play sports, go to the park, ride their bikes, go snow/water skiing, and just have fun! Miss Elena really loves kids, sports, and chocolate! She has three kids of her own so she knows A LOT about what boys and girls love to play. When she is at home, she likes to read, exercise, and play with her dog Sunshine, who loves to go for long walks in the woods with her family. Being active and having fun are two of Miss Elena’s favorite things to do whether she is at home or at work with you! Miss Jackie is a big kid at heart and she is always getting in trouble from her own big kids for playing with the children at church when she is supposed to be paying attention! She has 3 big kids of her own who keep her running. She likes to bake brownies and cookies as well as read lots of books. 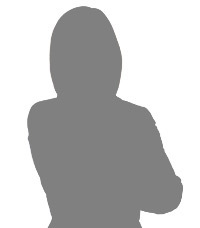 She enjoys painting colorful pictures and pieces of furniture and likes to imagine that she is a famous painter. Miss Jen loves working and playing with kids! She loves watching kids try something new for the first time and then want to keep doing it over and over again because they (and she) are so proud! She has two girls of her own and she enjoys watching their sports and arts, staying active, traveling, exercising, cooking, and doing yoga together as a family! She loves being an OT and now a Certified Yoga Kids Teacher (CYKT)! Mr. Jeremy really enjoys playing all sorts of different games. He likes hearing all the great ideas that kids have when they come to work and play at COTI. When he is not playing at COTI, he enjoys painting pictures. He also likes to play soccer, ride his bike and his skateboard. Some of his friends say it can be hard to read his writing so he has to remember to pay attention when he is writing important stuff! Miss Joan loves to play. She especially likes to give high swinging rides in the hammock and scooterboard rides down the ramp. Sometimes you will meet her when she is checking to be sure you are having fun and staying safe while you play at COTI. Miss Joan has three grandsons that call her “Grammy”. She likes to bake cookies – chocolate chip are her specialty. Miss Kristen Brevoort loves to play, make crafts, and learn new things. Miss Kristen really likes solving puzzles and problems and sometimes pretends she’s a detective. She loves working with kids to solve problems together! Miss Kristen knows everyone has things in their lives that are tricky, and she works really hard to help kids find their own ways to make the tricky things easier. When she isn’t helping kids at school, she is home hanging out with her husband, 3 boys, and their dog, Scout. Miss Julie loves to PLAY! She loves to swing and draw, but her favorite is throwing and catching a ball. It is probably because she loves baseball. She thinks an OT’s job is to help kids to do things easier and better so if writing, dressing, or even kicking a soccer ball is hard she likes to help with things like this. She likes to help kids figure out how to be the boss of gravity and get stronger by playing and doing obstacle courses. She likes to help kids practice being good play friends even when excited or distracted so she often is just like a kid herself when she is in the gym. Miss Karen loves being an OT and helping kids! She likes to laugh a lot and have lots of fun! Miss Karen likes to play volleyball and to read. She moved to Ohio from Texas where everything is bigger. Because of that she has a BIG sweet tooth! Chocolate is the key to her heart! You will love Miss Karen. Miss Kristen loves to use her brain and body to come up with fun, new games to play on the swings and in the gym! She loves to travel, run, do yoga, play outside, and go on walks with her husband and puppy, June Bug. When she is on her walks, she enjoys looking at the people around her and working as a detective to figure out if they are doing expected or unexpected things! Miss Kristen really loves to eat soft foods like yogurt and ice cream but does not like to eat chewy foods like meat. Miss Lisa has worked for COTI a really long time. She primarily works at a school with students from 3 to 18 years old. She loves to create her own games and will let you help set the rules. Puzzles, mazes and word games are a lot of fun too. She likes to do arts and crafts and doesn’t mind getting her hands messy. In her free time she enjoys walking her two dogs in the park, reading and watching scary movies! Miss Liz has been working at COTI since she graduated from Xavier University and still loves cheering on the Musketeers’ basketball team. When she went to school there, she used to paint herself blue for all of the games! Liz and her family like going to parks to play on new playgrounds. She likes trying foods from different cultures but nothing that involves seafood. She enjoys playing cards and word scramble games because those are the games she likes to think that she is good at! Miss Tara loves going on adventures with the kids that come to play at COTI. She enjoys blasting off into outer space in her cool airwalker swing spaceship and swinging on swings like monkeys. She even likes drawing silly pictures and playing board games. She has two cats named Dexter and Fritz. When Miss Tara isn’t playing at COTI she is playing at home with her two little boys who love climbing, jumping and creating all sorts of fun.